The earliest municipal council meetings were concerned in part with the condition of existing trunk roads and the construction of new local roads. Floating logs were creating havoc with the flimsy bridges across the rivers. The minutes of the second council meeting held at Brown's Landing on January 30th, 1880 show this concern. Moved and seconded that the Clerk put a notice on the Nicomekl Bridge, Semiahmoo Road, that the Bridge is unsafe for travel and cautioning persons from injuring the said bridge by letting logs float on the river and obstructing the navigation, also to serve a notice on the Logging Company Boys concerning the same. In June 1880 a by–law was introduced to allow settlers to work out one half of their taxes on roads. The Municipal Council proceeded to award a series of local contracts for the maintenance of existing roads, or construction of new ones. Semiahmoo Road maintenance contract to John Woodward for $140.00. Coast Meridian Road construction Sec.1 to Alex M. Anderson for $75.00. Coast Meridian Road construction Sec. 2 to H.C. McDougall for $425.00. Hall's Prairie Road construction, Yale to Grey's Corner to Alex M. Anderson for $69.00. McLennan Road maintenance to Alex M. Anderson for $119.87. By 1890 a number of additional roads were completed through Surrey. 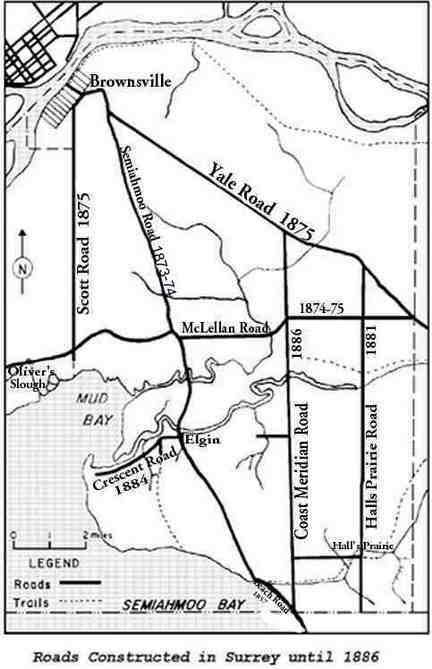 William Shannon, a local resident, was given the contract in 1887 to open the Hall's Prairie Road from Yale Road to the International Boundary, and provincial financial assistance was needed in the construction of the bridges. The Crescent Road from Elgin to Blackie's Spit was completed in 1884. It ran on its current route and followed Crescent Road and descended the hill on the beach by what is known today as Tullock Road. In 1886 the southern portion of the Coast Meridian Road was completed. This provided a north-south route from the International Boundary at Blaine to the Yale Road.